Trips Powered by the Class J #611 Steam Locomotive Bound for Lynchburg, Va., Charlotte and Greensboro, N.C. It used to be common to ride the rails, powered by a steam locomotive, taking in the sights and sounds of a weekend adventure. 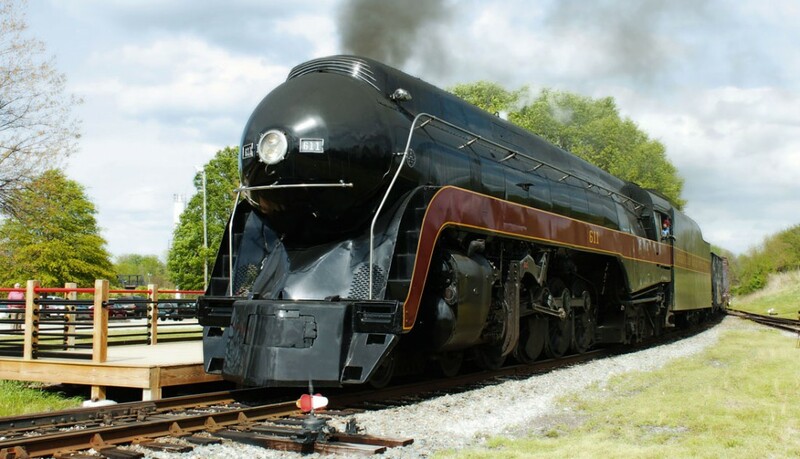 The N.C. Transportation Museum is providing this experience in the modern age, with spring excursions pulled by the iconic Class J #611 steam locomotive. This 1950s era steam engine, with its distinctive bullet shaped nose and streamlined design represents the height of steam powered technology. These trips are being offered in coordination with the Virginia Museum of Transportation, owners of the #611. April 8, a round trip day-trip to Lynchburg, Va. will be offered, while half day trips to Charlotte and Greensboro, N.C. will take place April 9. All trips depart and return to the N.C. Transportation Museum in Spencer. 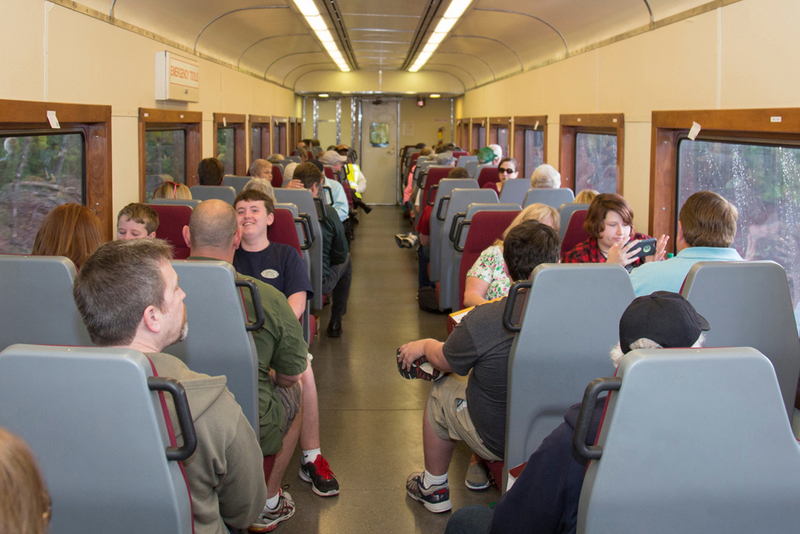 Those enjoying the April 8 trip aboard The Virginian will have a full day of rail riding and the pleasure of a historic destination. Departing the museum at 7 a.m., passengers will enjoy the rolling hills of the Piedmont and the Virginia countryside, arriving in Lynchburg at noon. The city features a historic downtown area with unique shops, historic sites, arts and cultural venues. Enjoy lunch offered at the Lynchburg Community Market, the third oldest farmer’s market in the country. Passengers may choose to take in a walking tour of the city’s seven historic districts, featuring homes built when tobacco tycoons, doctors, and attorneys made Lynchburg one of the wealthiest cities in the nation. Stroll through history with a Civil War Walking Tour across this one-time capital of the Confederacy. Or simply take in the sights and shops that sell art, antiques, and more. After three hours in Lynchburg, passengers will board the train for the return trip, arriving back in Spencer at 8 p.m.
Standard Class seating is $169/person and features a complimentary boxed breakfast and afternoon snack. Deluxe Coach seating is $209/person and includes a boxed breakfast and afternoon meal. Parlor Class seating is $299/person and includes a complimentary hot breakfast, boxed afternoon meal, complimentary hors d’oeuvres, soft drinks, and coffee. Dome Class seating is $399/person and includes the same dining features as Parlor Class. Dome Class cars however, offer glass topped roofs, providing panoramic views throughout the trip. Chairman Class seating, the most exclusive option, is $549/person. Seated aboard the Silver Solarium dome/observation car, guests will enjoy the ultimate in luxury and service. Attendants will prepare and serve hot meals, hors d’oeuvres, and soft drinks during the trip. Those riding aboard the April 9 half day excursions may choose between a morning trip to Charlotte or an afternoon trip to Greensboro. These excursions are an ideal opportunity to ride behind big mainline steam without spending a full day onboard. The Charlotte Special will feature the #611’s first trip to the Queen City since 1994. The train will depart from the museum grounds at 7 a.m. and will travel through the communities of Salisbury, China Grove, Landis, Kannapolis, Concord, and Harrisburg before passing through the Queen City. Passengers will get views of Charlotte’s spectacular skyline before continuing south to the Charlotte Douglas International Airport. This will be a rare opportunity to ride the rails into the new Charlotte intermodal facility built between the runways and under the taxiways of the airport, where the entire train will be turned before returning north. Passengers will not detrain in Charlotte. The train will return to Spencer around noon. The Piedmont Limited will depart from Spencer at 2 p.m. The train will travel through some of North Carolina’s most well-known furniture and textile producing towns, passing locally famous attractions such as Thomasville’s historic downtown and High Point’s furniture market. In Greensboro, the entire train will be turned before returning south. Passengers will not detrain in Greensboro. The return to the N.C. Transportation Museum is planned for 7 p.m.
Standard Coach seating is $119/person while Deluxe Coach seating is $149/person. Both options include a complimentary snack. Parlor Class seating is $189/person aboard a private rail car, while Dome Class seating is $259/person and features a glass topped rail car for panoramic views. Both options include hors d’oeuvres, soft drinks, and coffee. Chairman Class seating is the most elegant option, for $399/person. This features hot meals, hors d’oeuvres, and soft drinks while traveling in the height of style. Additional options for these trips will include an onboard Gift Station with items that represent the N.C. Transportation Museum, the Class J #611, and T-shirts that commemorate these 2017 spring excursions. You can receive benefits by staying in a hotel or other lodging facility in Rowan County. The Rowan County Convention and Visitor Bureau offers benefit packages for one, two, and three night stays. Once lodging is booked, visitors are encouraged to contact promotions@nctrans.org in order to guarantee their benefit package will be waiting for them upon check in. Full details regarding these trips can be found at www.nctrans.org. Tickets may be purchased online, or by calling 1-844-613-0611. Previous Topic: Celebrate Steam Engine #17 on Feb. 11, 2017, at New Hope Valley Railway. Celebrate Steam Engine #17 on Feb. 11, 2017, at New Hope Valley Railway.